A sample of some of the hundreds of letters we get from our divers. Some of the slipways and details of launching. Details of this wreck and how best to dive her. Details of our mid week breaks, over three days or less. Details of this wreck found in Jack Sound. 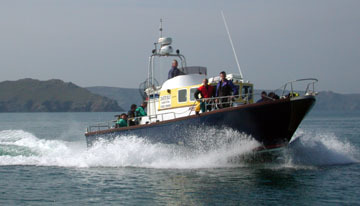 A list of marine sightings both above and below the waters along the Pembrokeshire coastline. Marine life found in and around Pembrokeshire. Details of this wreck found on the north coastline. More information on Pembrokeshire are the area. Details on our land based photographic courses, now very popular. A description of villages and places of interest around Pembrokeshire. More details of this fasinating Island. A group of Islands 23 miles out to sea. Tidal streams in the area. List if spring and neap tides. A wreck found in teh Haven at 22 metres. Details of diving and events arranged throughout the year. Details of all listed wrecks in the Pembroekshire area, most of which are undiscovered. All listed wrecks in Pembrokeshire, with details of how to find them, slacks etc. Weather reports, past, present and future. Updated daily. Details of accommodation found in and around the Dive Centre. Details on the boats available for hire. Details about some of the caves that lie around the Island. Found on the north coast, detaisl of this wreck. Details on conservation around the area. A wreck found in the Haven, small but interesting. A form to fill in via email if wishing info sent via the web. Details of this wreck in the Haven. Dive sites found on the north coast. Dive sites found on the south of the coast, including The Smalls. A map of how to find us.